An inventory of ponds in Champaign County, Illinois, and an unfolding story of diversion and containment, transformation and control. Bodies of water recorded in the original land survey of 1821-22 and since drained (left) are juxtaposed with extant ponds and roadside borrow pits (right). "The secret to farming is dung and drainage." This credo, coined in the 19th century by New York state farmer and drainage innovator John Johnston, reflects the importance of a well-drained field to agriculture. But perhaps nowhere was drainage more important than in the wide-open Chicago Wilderness of that century, where the prairie's rich soils, interspersed regularly with marshes and ponds, beckoned legions of farmers. Before the European wave of settlement, more than eight million acres of wetlands, home to thousands of unique plants and animals, covered nearly a quarter of Illinois. But over the course of a century, men dramatically transformed the landscape, reducing its wetlands to just more than one million acres with the help of a simple length of pipe — the drain tile. Since the adoption in 1878 of the amendment of the State Constitution of 1870 (Section 31 of Article IV, commonly known as the 'drainage section'), great tracts of land in the county, before then incapable of being cultivated, have been drained by artificial ditches and by tiling, and are now reckoned the best, and have been proven to be the most valuable, lands in the country. A feature of many landscapes of the county, quite noticeable before the prairies were broken and drained, were the many sink holes found, even upon the highest grounds. These holes varied in size from a square rod to an acre or more. They were sometimes several feet in depth below the level of the surrounding prairie, and, in the early times, afforded water for the great part of the year, thus becoming useful to the early stock raiser and traveller. Various causes for the existence of these holes have been advanced, but it is thought that none are more reasonable than the claim put forth in favor of the wild buffalo which, for ages, roamed over these plains before the coming of the white man. The same variety of ponds are, in the remote West, to this day called "buffalo wallows," which name, originating when the habits of the animal were well known in those regions and upon the grounds where the work of excavation was going on, may well be received as authoritative. 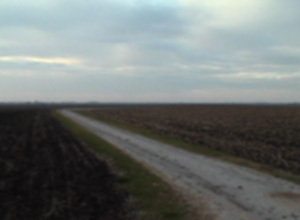 Original prairie land is now wooded; original wooded land is now cornfield. 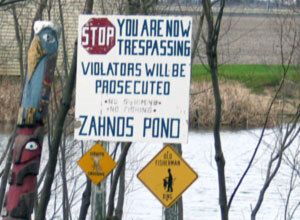 Pond land is now cornfield; once wooded land is now pond. The cities, towns, and villages at the present time present a wooded aspect, yet all of them were originally platted on treeless prairie. Cornfields that once were prairie groves are undistinguishable except by soil analysis from fields on original prairie. Most of the old sloughs and ponds have been drained and have become productive farms. One of the most ambitious peace-time programs ever undertaken in the United States was authorized by the Federal Highway Act of 1956. This legislation called for the construction of a system of superhighways that would connect, as directly as possible, the largest cities of the country and link with appropriate international border locations, while at the same time keeping the needs of localities between the major cities in mind during the planning and construction phases. As with other road-types, it is frequently necessary to transfer earth materials from one site to another in order to bring sections of these superhighways to a desired grade.... The materials which are transferred are usually obtained (1) by removing high spots or banks along the same road or project, (2) by digging gutters or ditches alongside or near the fill site, or (3) by hauling (a) from necessary excavation on other jobs, (b) from commercial pits, or (c) from borrow pits opened just to obtain fill. Although the term borrow pit does not necessarily involve a perceptible pit as defined by lexicographers, in the opinion of the author a relatively noteworthy trend has been established in the construction of the Illinois superhighways. This trend involves, in essence, the creation of a significantly larger number of distinct depressions or cavities, or bona fide pits per mile than in the construction of other road types. As of January 1970, 612 borrow pits along 1235 miles of completed or nearly completed Interstate Highway, Illinois Tollway, and U.S. Highway 66 had been verified and recorded.